Our San Tan Valley clinic, located at Hunt Hwy & Bella Vista, provides patient-focused care for restorative health. 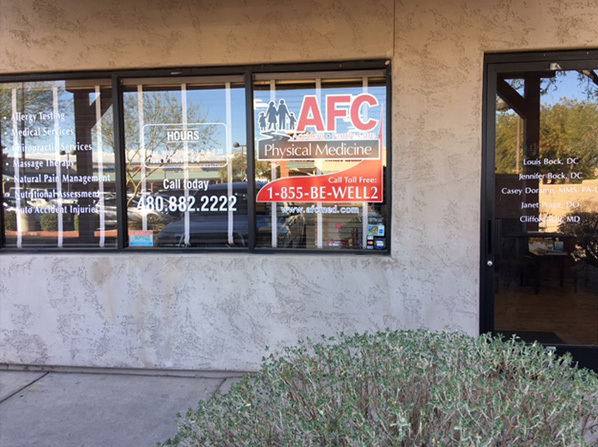 At AFC Physical Medicine & Chiropractic Centers of San Tan Valley, our chiropractic team works diligently to provide a welcoming environment that encourages better health and wellness. Through our comprehensive programs, the San Tan Valley team hopes to eliminate your pain and drastically improve your level of activity, quality of life, and so much more. Our advanced diagnostics and treatments aid the physical rehabilitation process so you can experience relief safely and efficiently. Dr. Bock came up with an eight week program and today is my last day. I’m so sad because I’ve really come to know and love all the people here. They’re so friendly; they just make you feel really comfortable. They gave me all the knowledge and information I need to actually succeed. Are we on your insurance? We accept most insurances,, but please check our current insurance list to make sure your plan is accepted.